The Texas House of Representatives officially kicked off this holiday season earlier this month by unveiling an impressive 23-foot-tall Christmas tree that sits in the center of the House chamber in Austin on full display for Capitol visitors to see. As part of the annual holiday tradition, the speaker of the House invited all members of the House of Representatives to create an ornament for the Christmas tree, which showcases what makes each district so unique to Texas. For this year’s District Ornament Project Christmas ornament, I selected one of our region’s natural landmarks, Quinta Mazatlán World Birding Center, to be featured as a symbol of House District 41, which encompasses the cities of McAllen, Mission, Edinburg, Palmhurst, Palmview, Alton, and Pharr. Quinta Mazatlán is an urban sanctuary with a clear vision: “Enrich people’s lives by sharing knowledge about birds, plants, and environmental stewardship in South Texas.” Full of native flora and fauna, Quinta Mazatlán demonstrates the unique cultural and natural significance that the Rio Grande Valley brings to the landscape of Texas. 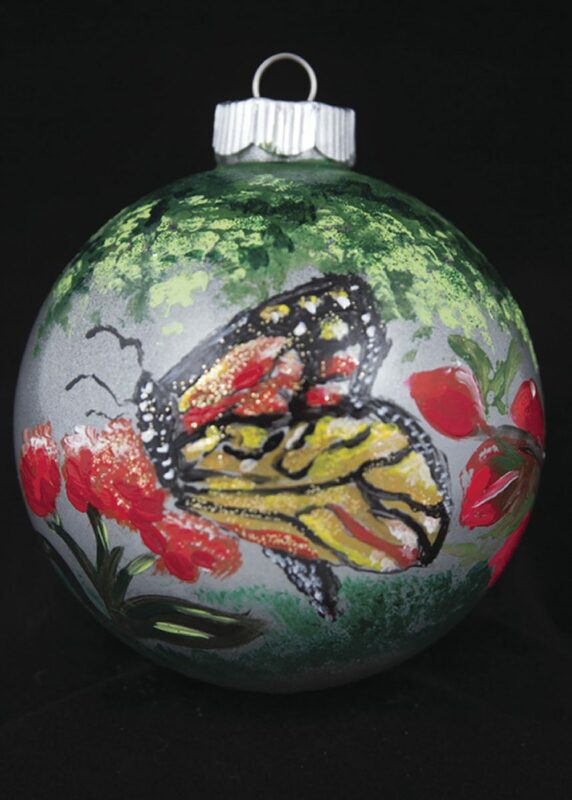 The ornament was designed by Laura Mangelschots, an established local artist and Valley native. Above: State Rep. R.D. 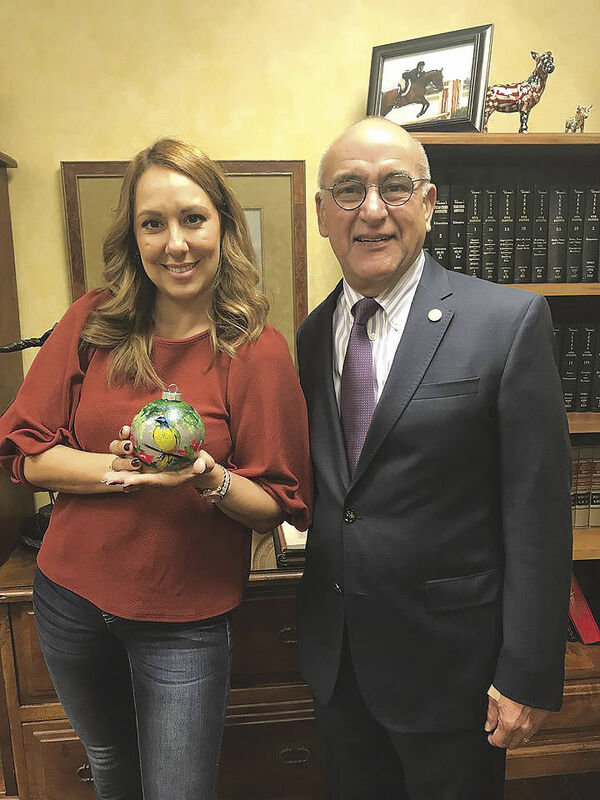 “Bobby” Guerra is seen with local artist Laura Mangelschots, who is showing the ornament that she designed to hang on this year’s House Chamber Christmas Tree at the Capitol in Austin. Detail of the ornament hanging on the Texas Capitol tree in 2017 from the RGV which bears a butterfly and other nature found at Quinta Mazatlán in McAllen. “Full of life and color, this ornament honors the natural beauty that fills south Texas, especially at Quinta Mazatlán. This Spanish revival-style estate in McAllen is home to hundreds of bird and butterfly species, including the monarch butterfly that migrates through this region on its journey to Mexico,” said Mangelschots. The ornament’s dual-faced design features a monarch butterfly, which can be viewed symbolically to depict new life, spiritual souls, change, and hope. Also pictured on the ornament is a green jay, one of many birds that shows off its beauty and vibrant colors in Quinta Mazatlán. The gorgeous bougainvillea flower, popular in this region, is also painted on the ornament. This annual holiday tradition is a great way for state lawmakers to come together and show the camaraderie and goodwill that fills our Texas Capitol. This allows us the opportunity to proudly display the unique character each one of our 150 House districts brings to the diverse cultural landscape of our great state. The District Ornament Project was started in 2009 by Julie Straus, wife of House Speaker Joe Straus, R-San Antonio. These ornaments are hung and displayed for thousands of visitors to see during the holiday season. Holiday traffic usually exceeds more than 20,000 guests throughout the month of December. The tree will remain on full display until Jan. 3, 2018. I wish everyone a safe and happy holiday season, from my family to yours. May God bless Texas and the RGV, today and every day.